The other day on Instagram, Kristin posted a picture of her stacks of fabric and asked for help. 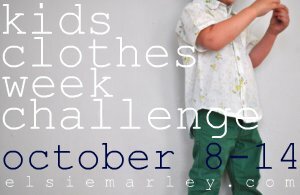 She had a ton of ideas for Kid’s Clothes Week Challenge but wasn’t feeling really excited about anything. I was in the same boat. So I told her I’d email her a list of all of the KCWC ideas I had, she could pick her favorite ones, and then we’d both make them and compare once they were finished. She whittled down the list for me, and now we have a plan. YAY!!! Extra motivation for us both to help us get it done. Super fun. pretty self-explanatory. find an adult tee to convert to a miniature skinny tee. Fun! Pierrot is one of the fastest patterns in the universe (second perhaps to the Flashback), and when you leave off the ruffles and just shir the neckline and sleeves with elastic thread, it goes even faster. Don’t have the Pierrot pattern? Use any peasant blouse-type pattern (or buy Pierrot?). One thing I suggest if you use Pierrot: I like to add about 1″ to the folded width of the tops of each of the sleeves to add more room around the neckline for the shirring (4″ total). I posted a shirred Pierrot last week if you need an idea of what it looks like. I’ve had a little outfit clipped from the crewcuts catalog from earlier this summer featuring a little skirt I’ve been dying to make for Clementine. And Mini-Boden, BabyGap, and Hanna Andersson are always pumping out cute stuff I want to copy. Want to sew along? Join us! This was just a low-key* challenge designed to motivate us, so if you like any or all of these ideas, go ahead and make them along with us this week and then let us know!! Remember, the point of KCWC is to spend 1 hour each day sewing for your kids, so these are not meant to be ridiculously intricate or time-consuming. Just easy, cute items to add to your kid’s wardrobe. And if nothing here floats your boat? No bigs. Can’t wait to see what you make! Fun things are always popping up in the KCWC pool!. Oh my. I laughed so hard when I read that comment on her photo. Can’t wait to see what you guys come up with! You two are hilarious! Way to make KCWC even more fun! I already have some upcycled skinny tees on my to-make list for this week so I guess great minds think alike:) Excited to see what everyone comes up with! I love you guys. This is so fun. And I would never have the cojones to face off against either of you. Way to invoke the competitive spirit! great minds do think alike Brooke, finished cutting out my up-cycled skinny tees this morning. No the shirred versions were not cut on the bias! Thanks for making KCWC even more fun!